September Kickoff: Your gateway to the holiday season! It’s Gia with your monthly kickoff post. I love the fact that from September through December every month brings the joy of ushering in the change of seasons and my favorite holidays. First and foremost, isn’t the September kit stunning? It was absolutely perfect for all of my photos this month. I have been looking forward to sharing some of the ways I used both kits together this month! I hope you too have been able to get in on both the main and traveler’s notebook kit subscriptions! I just love how this dreamy Fancy Pants Designs paper captures the essence of a road trip exploring the countryside, and these wildflowers on the 1Canoe2 Creekside paper were just calling to be fussy cut and layered! Plaid is all the rage right now and I loved using it to document the newest love of my life-our new adopted dog Kira. I didn’t even come close to killing my Sundance main kit before moving on to some TN layouts with a mixture of main kit scraps and the September TN kit! Ashley Horton always knocks it out of the park with her fun trendy collections and I had to break into the TN kit for some llama action! Here’s another peek at it in case you missed it. I can’t wait to see what you all have made with both of the beautiful September kits. Here is your official invite to the Clique Kits World Card Making Day online event. We never require you to purchase a kit to participate in our online community and hope whether you pre-order a card kit or holiday kit or just BYOS you will be there to create with us! We will have sketches to inspire you, challenges to rock, and prizes to be won! This year we are focusing on getting those holiday cards made ahead but you can always use the ideas to create any occasion cards! Traditional red and green do it for me when it comes to Christmas papers, how about you? I am drooling over this kit just filled to the brim with Simple Stories products because of its fresh take on everything classic! We hope to begin shipping the Clique Cards kit right after the September Kits go out. Please let us know if you order and plan to participate in the World Card Making Day event to be sure we get it to you in time! Next up you can just feel the vibe of this year’s Clique into the Holidays MEGA limited edition kit, can’t you? Everything you need for everything December is in this phenomenal kit! Both of our limited edition holiday kits are only here for a short time, while supplies last. They have an unbelievable retail value for the price, and those who have been in on them before will tell you there is no bigger or better value for the holidays. Get all the details in the Clique Kits shop! All of our card and general holiday kits mix and match with those of previous years to extend your stash even further. There are also add ons and digital items designed to coordinate with them perfectly. Check out the Clique Kits Limited edition holiday kits section of the shop for loads of great products! Don’t worry, we haven’t forgot those other two holidays between summer and Christmas…namely Halloween and Thanksgiving. 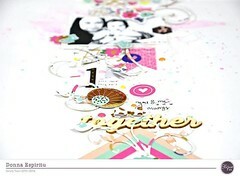 Clique Kits has you covered there with new seasonal embellishments and workshops. You can sign up now for either October Bucket List or Documenting Gratitude workshops with kits included! The October Bucket List project will feature exclusive printable embellishments in addition to everything you need to follow along and make 7-8 lush traveler notebook layouts! For more ideas and inspiration, check out the Clique Project sheets section of the website. You may also like to pick up one of these NEW traveler notebook cover sets! These are available by pre-order now and are perfect for doing a gratitude journal or for transitioning your latest traveler notebook inserts from a summer to a fall cover! Categories: Monthly Kickoff | Tags: 1canoe2, december, fancypantsdesigns, Halloween, holidays, inspiration, kit club, scrapbooking, September Kit, sundance kit, Travelers Notebook | Permalink.